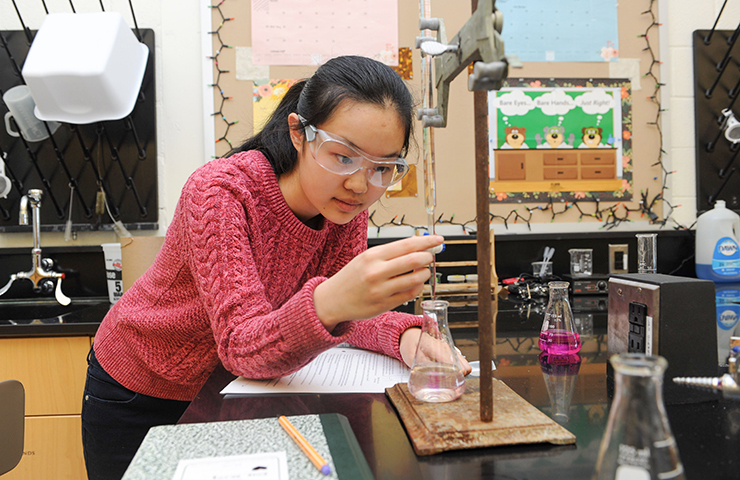 Ellen Zhang ’21 is currently ranked among the top 1,000 high school chemistry students and the top two hundred tenth grade math students in the United States. Her outstanding success on two recent exams has qualified her as such. Ellen’s exceptional performance at the Philadelphia competition of the 2019 US National Chemistry Olympiad has qualified her for the next round, the National Exam. Organized by the American Chemical Society, the Olympiad is a competition for high school students that tests their chemistry knowledge and laboratory skills. Ellen will take the National Exam on April 27, 2019 at La Salle University. Only the top 1,000 chemistry students take the exam which will consist of both a written exam and a laboratory practical. “I’m excited about the upcoming exam, and I will try my best to prepare,” said Ellen. In addition to her success in chemistry, Ellen was also one of four George School students to sit for the AIME, the next level of the American Mathematics Competition exam last month. Based on her outstanding performance, she has been invited to sit for the USA(J)MO. The top students from the USA(J)MO are invited to the Mathematical Olympiad Program in the summer after the exam. Students from the Mathematical Olympiad Program are then eligible to be selected for the following summer’s six-member team that will represent the United States of America at the IMO. Ellen is the first George School student to qualify for both exams since 2014, when her brother John Zhang ’16 did the same. Best of luck to Ellen on both upcoming exams.